Review written by Glenn Van Bockstaele. 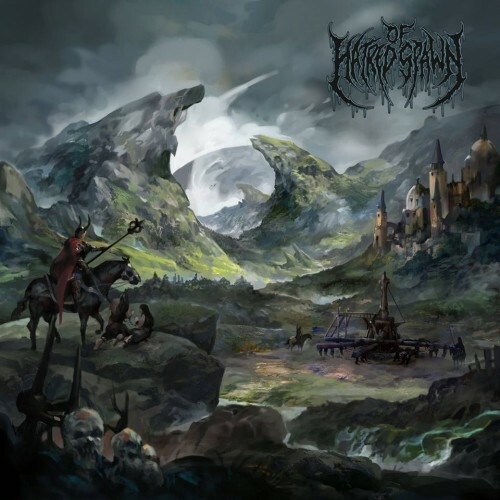 Of Hatred Spawn is a Canadian death metal band formed in 2017 and recently they’ve unleashed their self-titled debut album through Canadian record label Boonsdale Records. We got the album through Asher Media Relations, thanks a lot, Jon! The release starts with “Overtune,” an operatic piano intro with a threatening undertone. Then the band kicks in with the ferocious “Global Dehumanization” track, a tune spiced with plenty of deathcore including grunting, screaming and blast beat drumming but behind that layer of raw savagery you can clearly hear the band’s more melodic side and that sense of melody gets further amplified and expanded during the album’s next tracks. Up next is “Nest Of Vipers,” a slightly slower song except for the occasional sudden tempo changes. One thing that I personally love about this song are Matt’s vocals. He goes for a slightly harsh clean vocal style during the slow parts and during the fast sections he shrieks and grunts in excellent synchronization to the hard-pounding beats. And let’s not forget this song’s epic breakdown finale! The album’s fourth track, “Severed Limb Convulsion,” is a tune that in terms of title and style could’ve easily be part of Cannibal Corpse’s discography. It’s one of the heaviest songs of the album and ticks off all the classic gory death metal boxes. Deep grunts, sharp and frantic riffs, double bass drum lines and a soaring guitar solo in the middle part. This song just keeps on pounding and pounding and I love it, just as much as the following track! And that track is called “Plaga.” The longest song on the album and it’s another death metal gem, once again mixing classic death metal with modern deathcore in one viciously energetic tune. There are moments for violent headbanging, moshing and jumping around playing air guitar, sometimes all at once! Up next is “Nocturnal Swarm,” a pretty catchy song with another great technical guitar solo and with angry screams and pig like growls (without overdoing it, yes, it’s possible!) seemingly singing in duet with each other despite the fact that all vocals are done by a single guy! And finally there’s “God Of Wrath,” the most chaotic song on the album but it still remains a well-structured and balanced song just as all the other songs on this release. It’s one final throat-ripper before the album suddenly ends. Despite this being the band’s first set of recorded material I have plenty of high hopes for Of Hatred Spawn. Their sound is a multi-faceted beast of melodic death metal, brutal deathcore and vocals that maintain a consistent rhythmic intensity while varying between shrieks, grunts, growls and screams. A well balanced package overall! Of Hatred Spawn’s debut isn’t a long album, but like a true rollercoaster ride this is a release full of speed, raw power and finesse. And courtesy of Boonsdale Records themselves you can enjoy the full Of Hatred Spawn album right here! Bon appétit!